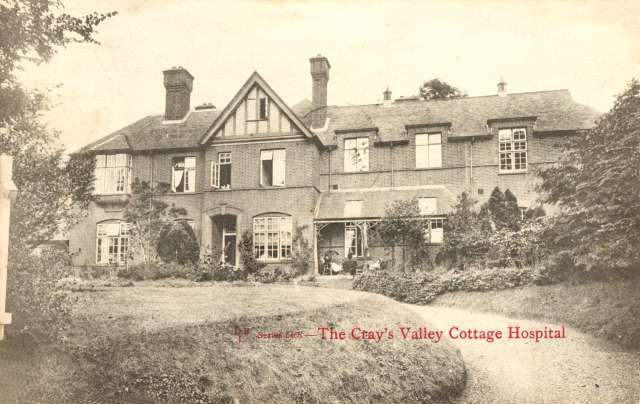 Built in 1882, by the grandly named Chislehurst, Sidcup and Cray Valley Medical and Surgical Aid Society and opening two years later, this hospital had a variety of uses in its 90 year history. Extended on a number of occasions and substatially rebuilt in 1924, by the 1940s it was one of the area's leading hospitals. Mostly a general unit, it has also had periods as both a maternity and a geriatric hospital. By the 1960s it was in decline and in 1974 it was closed on completion of the new Queen Mary's Hospital at Sidcup. Subsequently it has formed part of a leisure complex.